As you probably already know, I only take a limited amount of clients a week. In fact I don’t book more than two sessions a week… I like to spend quality time with each of my clients and their images. As it happens… this week my two sessions are children sessions… so to give you a little something to look at on this amazing Senior Only Blog, I’ve decided to share a before and after shot. The image on the left is the image straight out of camera as it was shot… the right is the final image in Libby’s gallery. I love seeing these… the difference is subtle but still amazing! And this way you can see that the editing is minimal but affective. I don’t want my girls looking like plastic dolls… I want them to look like models in a magazine. You can still see her natural gorgeous skin and the contours of her face. If you are graduating in 2013, still looking for a Saginaw Senior Photographer and are interested in The Ultimate Senior Photography Experience with Miss by Marissa McInnis, contact me ASAP to book your session. There are only limited spots left in 2012, so book now to reserve a date!! I’m also looking for Senior Models from the following schools that are either 2013 or 2014 seniors: Freeland High School, Swan Valley High School, Heritage High School and Nouvel Catholic Central High School. If you are interested in Modeling for me, please contact me for more information and to see just what you get for modeling with Miss by Marissa McInnis. Samantha - These are absolutely stunning. Alisha Baker - Marissa, these are just gorgeous! Amanda - Marissa, your work is phenomenal. Seriously, I am in awe. … and a Behind the Scenes! Meet Libby, a class of 2013 senior at Valley Lutheran High School. This session was nothing short of amazing! I am so thrilled that I got to photograph Libby… She was PERFECT! I’m dying to show her and her family the awesome photos we have from the few hours we spent together last Friday. Until then, a little Behind the Scenes… AND her Sneak Peek. 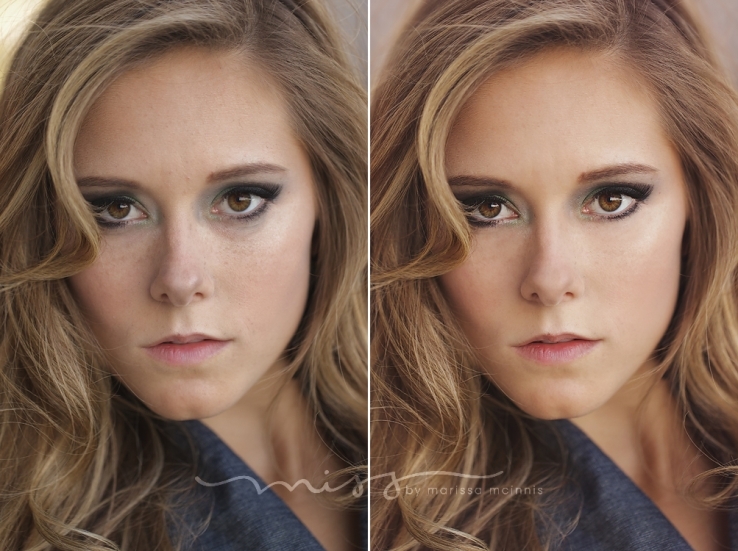 The photo in the middle of the BTS is a before photo… and her Sneak is the after! How amazing is that?!!! Oh and that new little piece of coral gorgeousness you see on these two images, yea.. just a a little preview of what’s to come for seniors & Marissa McInnis Photography! Thank you, Cassondra…and Allison and Dana! I am so glad that I was chosen to be Cass’s senior portrait photographer. <3 If you still need to get your senior portraits taken yet this year, and you know Cassondra, chat her up about having your session with MISS by Marissa McInnis (the senior exclusive branch of Marissa McInnis Photography), she may have a special offer just for YOU! Also, all seniors interested in having their photos taken with me will get a behind the scenes look at Cassondra’s session that is featured in the Senior Magazine. Get your virtual copy today by contacting me! Ally - These are amazing… your style is so fresh!